Google marked what would have been the 121st birthday of late Lebanese feminist, translator and author Anbara Salam Khalidi with a Google Doodle featuring this remarkable woman whocontributed to the emancipation of Arab women. Born on 4 August 1897 to a large Lebanese family, Khalidi was one of 12 children in a family of "a hardworking mother and a prominent and well-connected father," Google explains. Khalidi's father was Salim Ali Salam, a deputy in the Ottoman parliament and a merchant, while three of her siblings were active in Lebanon's political scene, her sister Saeb Salam was a former Lebanese prime minister and two of her brothers served as cabinet ministers in the country. In an era when the idea of educating girls at all was controversial, encouraged by her father, Khalidi attended one of the best foreign schools in Beirut, Google clarifies. "Her education also included a visit to Cairo in 1912 where she enjoyed museums, exhibitions, boat-rides on the Nile and experiencing the Egyptian culture and heritage. She returned to Egypt in 1920 where she attended a gathering in memory of Qasim Amin, author of The Liberation of Women and The New Woman, which was also attended by pioneering feminist Huda Shaarawi. "In 1915, Khalidi formed a society called The Awakening of the Young Arabic Woman, which helped girls finance their education." "She also was one of the founding members of the Society for Women’s Renaissance despite a brief hiatus when she visited England." Khalidi translated Homer's works including Odyssey andVirgil’s Aeneid into Arabic, being the first person to take those tasks on her shoulders. In 1978, she published her memoir Jawalah fil Dhikrayat Baynah Lubnan Wa Filastin (A Tour of Memories of Lebanon and Palestine). The memoir was published in English under the title Memoirs of an Early Arab Feminist (2013). Shortly after the memoirs were published in English, Sarah Irving wrote for The Electronic Intifada the following: "Memoirs of an Early Arab Feminist tell a life story which spans Ottoman, British and Israeli colonialism. Translated by Anbara’s son Tarif, this slender autobiography challenges many stereotypes about the place of women in Arab society, as well as being a reminder of the artificial and cruel ways in which the modern Levant is fragmented." Khalidi married Ahmad Samih Al-Khalidi, a Palestinian educator, writer and translator, with whom she lived in Jerusalem briefly before moving back to Beirut. She died in May 1986 at the age of 89. 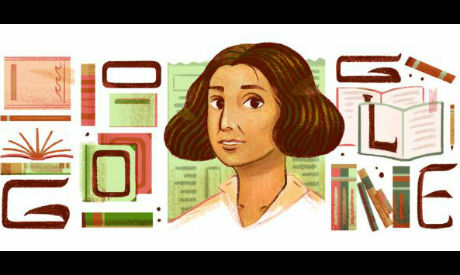 "Today’s Doodle highlights how Khalidi used the written word to spread her message of equality," Google writes. The Doodle can be viewed across the Middle East and North Africa.